There are a few things I'm really picky about, but if I ever compiled a list, bagels would be at the top. Blame it all on New York City and the bagels I grew up eating. During my childhood I couldn't get enough of blueberry and strawberry bagels but for whatever reason I switched to cinnamon raisin bagels in my teens. 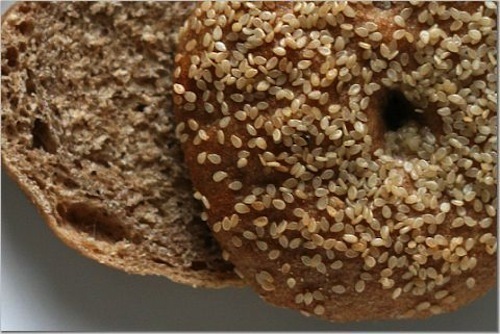 Now that I'm a health-conscious adult, I opt for whole wheat bagels though I due spurge on a pumpernickel bagel from time to time. While I've since returned to the place that started my obsession, I'll never forget the whole wheat bagel recipe that got me through the year and a half I lived in Los Angeles. Try these babies and I promise, you'll never buy store bought bagels again. Reviewed by Whatagig:I am a native New Yorker - born and bred in Brooklyn and still here. It's true. There's no better place to buy a bagel, but I have to tell... I made Happy Herbivore's recipe this week, and they were AWESOME! We loved them! I made "everything on its"---onion, garlic, poppy seed, sesame seed, and kosher salt on the top, bottom, sides - everywhere. I wish I could show you a picture of them. I even shared them with friend's (omnis, also native NYers). They couldn't get over it and said they were better than the bagel store. Really, they genuinely meant it. For anyone who was born here to say that is saying A LOT!!! Give them a try...easy and delicious! Life without real bagels is no life at all. Mix 1 cup warm water, yeast and 3 tbsp sugar together then set aside. Mix flour, gluten and salt in a large bowl. Once yeast mixture is fomay and beige color it's ready. Make a well in the flour and pour yeast mix into it (it will overflow). Mix around with a spatula until its too doughy to do so. Once dough forms, use your hands to finish combining and knead the dough until its a smooth ball. Let rest for 2-3 minutes. Divide dough into 4 sections. Roll each into a snake, about 1" thick or less. Wet ends of snake and combine together. Set bagels aside and let rise for 10 minutes. Meanwhile, fill the biggest pot you have 2/3 full with water and add 1-2 more tbsp sugar. Also preheat oven to 375 F. Once water is boiling (and bagels have rested for at least 10 minutes) place bagels, using tongs, into the boiling water. (I usually do one at a time, but if you have a BIG pot, you might be able to double up). Boil each bagel for 30 seconds on each side, using tongs to flip. Gently remove bagel and place on non-stick or greased cookie sheet. If you want seeds or spices on top, add them here. Bake 20-30 minutes, but be careful not to burn the bottoms! They come out piping HOT so wait 10 minutes to eat or handle.